Point-of-care ultrasonography has the potential to save billions of dollars on an annual basis across health systems It is has the capacity to revolutionize patient care and improve procedural efficacy, decrease complications, and limit pain and suffering. Advances in ultrasound technology have fueled the emergence of point-of-care ultrasonography, including improved ease-of-use, superior image quality, and lower cost ultrasound units. The primary barrier to future universal adoption of this operator-dependent “stethoscope of the future” is the lack of widespread, efficient, and affordable training solutions. (Frost and Sullivan, Moore) The need and demand for ultrasonography training has grown in parallel to the expanded use of ultrasound technology. 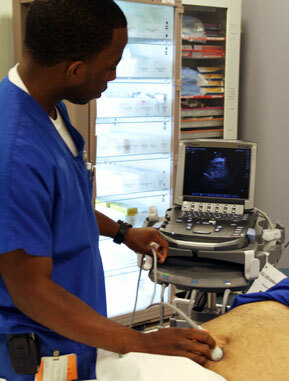 Point-of-care ultrasonography improves healthcare. While traditional methods of performing a physical examination are of critical importance, healthcare practitioners that become skilled in the use of point-of-care ultrasonography become uniquely empowered. Higher fidelity, lower cost, and smaller (handheld) ultrasound units coupled with innovative ultrasound training solutions (e.g., SonoSim® Ultrasound Training Solution), have created a unique opportunity. Healthcare providers, facilities, and health systems that strategically incorporate point-of-care ultrasound into clinical practice will rapidly distinguish themselves from those who refrain from incorporating this highly valuable modality. Kendall JL, Hoffenberg SR, Smith RS. History of emergency and critical care ultrasound: the evolution of a new imaging paradigm. Crit Care Med 2007 May;35(5 Suppl):S126-S130. Moore CL, Gregg S, Lambert M. Performance, training, quality assurance, and reimbursement of emergency physician-performed ultrasonography at academic medical centers. J Ultrasound Med 2004 Apr;23(4):459-466.